The goal of the program is to help your child excel in math and language arts. I was given a year subscription for 3 children. The cost of IXL for 1 subject for one month is $9.95. Do both subjects for one month for $15.95. Once you try it out and love it, sign up for a year for 1 subject for $79. Both Subjects for a year for $129. Have more than 3 children, you can add them on for $2 a month or $20 a year. Check out the online Math membership and online Language Arts membership for a feel of what specific things are covered in this program. I used this opportunity to try IXL with my 9 year old daughter in Language Arts. I must admit I was a bit confused with this program and my daughter felt like it was just more work in addition to what we were already doing. I do see great potential in this program if I could find a better way to incorporate it into our day. Shiloh is also not a great reader yet, which made this program harder for me to use. I had to sit right there beside her and read everything to her. I would love it if it would read the questions to the younger kids. I think the older kids who need practice may get some out of it, but for me it was easier to just learn the items on our own rather than using the IXL program. We have access to everygrade level and the questions for Math and Language Arts. I had Shiloh start out younger, just unsure of where we would fit in to the grades. We tend toward not assigning grades and have a struggle figuring out exactly where we fall in the line up. The Math program includes K-12 and now has Geometry and Algebra II. I think the extra help in these areas would be great for high schoolers. I feel that this program would be easier to utilize for those upper grade levels than for the ages I chose to work with. The Language Arts program is currently just grades 2-4. Comprehensive coverage of K–12 math curriculum. Your kids won't miss a thing! Interactive language arts exercises for grades 2–4. Unlimited questions in over 2,000 skills. Fun and colorful practice formats. Questions that adapt to your child's ability, increasing in difficulty as they improve. Immediate feedback and question-specific explanations to solidify understanding of each concept. Audio for all pre-K to first-grade math skills. Weekly e-mail updates on your child's progress. Informative, detailed reports pointing out successes and trouble spots. Awards and certificates for you and your children to print out as they reach important milestones. iPad app for mobile math practice. The program is basically a bunch of worksheets, or review sheets, organized into grade levels and skills. If you were skilled in teaching you would be able to utilize these online worksheets once the skill has been taught. It is also great if you are in school and following a core curriculum, they would follow along perfectly to use for review. There were not enough bells and whistles and games for my younger children. As a teacher I think it is very well set up, and organized wonderfully. I think it will be a great asset for when we need practice in specific things, but it just isn't going to work as a complete program for my young ones. 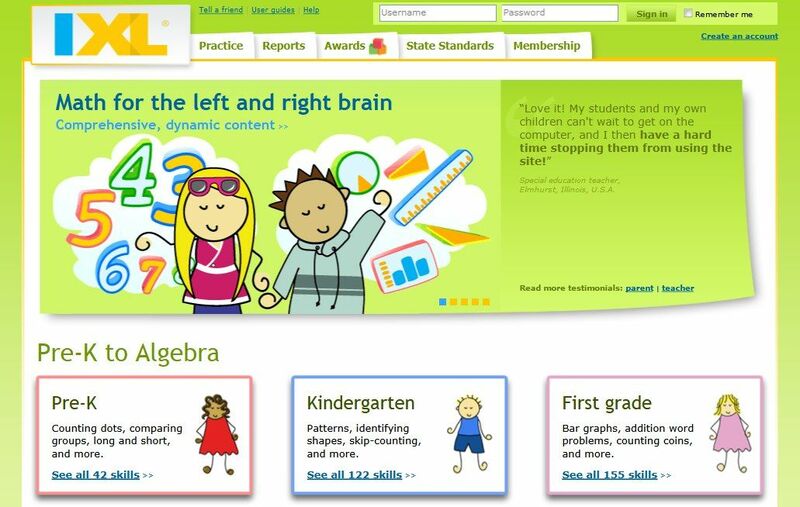 There are lots of reviews on the IXL program for you to check out by clicking on the banner below. See what some Crew Members with older children thought of this program. I will be checking them out for sure.